Whimsical and lovely, here is an arrangement that is sure to warm their heart. 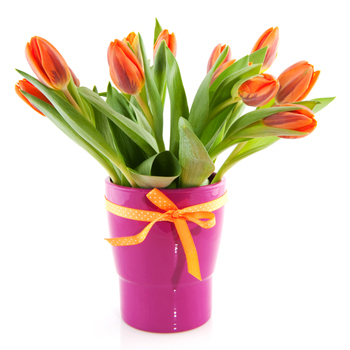 Your recipient will enjoy a gorgeous bouquet of sunset-colored tulips just beginning to bud arranged in an elegant glass vase and accented with white lace. Ideal as a gift for Easter, as a centerpiece at a family gathering, to say Get Well Soon, or Thinking of You the Tulips Galore Bouquet is versatile and beautiful.